Salma Hayek sports a basic black look for her interview at ITV Studios. Salma arrived in Level 99 Dahlia Flares in Black and a pretty black blouse. 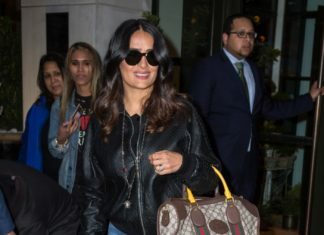 Little Valentina Pinault catches a nap in her Momma's arms at LAX while Salma Hayek struts through the airport in Hudson Jeans Signature Bootcut Jeans. 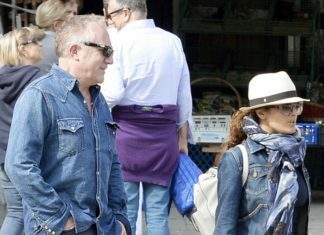 Salma Hayek was spotted shopping in West Hollywood wearing 7 for All Mankind Super Flare Jeans in Ibiza wash. They make her derriere look so fab! Salma Hayek is shown here arriving at the Stand Up To Cancer Benefit wearing a pair of wore a pair of J Brand Ã¢â‚¬Å“Love StoryÃ¢â‚¬Â jeans in Miner.